Marianne was never supposed to return to town, the town where she grew up in the shadow of the Nazareth Mental Hospital. Her mother may be suffering from dementia nearby, but she had thought she'd left that place, and its dark secrets, behind her. That is, until her husband buys a flat in its newly renovated interior so that she can be close enough to help her mother, and Marianne can't tell him why the place fills her with such dread, she can't risk destroying the careful life she's built. I quite enjoyed Kelly’s writing and marked some phrases and paragraphs which leapt out at me. This novel starts in the present with the arrival of Marianne in her childhood hometown to spend time with her ailing mother, and sets off a chain of events, stirring up mysteries dating back to the (early and late) 1980s. As the blurb mentions, her husband, thinking he’s doing the right thing to surprise his wife, buys a new refurbished luxury apartment in what was once the Nazareth Mental Hospital. The ‘worst’ it seems, has happened and the secrets are decades old but they resurface now and threaten the harmony (rather than the safety) of those involved: Marianne and her family; her childhood boyfriend Jesse; and a prominent Member of Parliament, Helen. Kelly slowly reveal secrets of the past and the revelations are well timed with the unfolding of events in the present, though I’m not entirely sure they offered the suspense or climax I was expecting. Ultimately there was something about this book that left me a little unmoved. I noted that Kelly co-wrote a novel based on Broadchurch (the show) with TV writer Chris Chibnall. I enjoyed that show which was a bit of a ‘slow burn’, reflecting a sense of subtlety; but think there’s a difference between that and something being a bit underdone or anticlimactic. Despite all of that, this is still an interesting read. I’ve read a few books now about mental health treatment of the past and it’s always horrific (ie, reference to lunatic asylums), though I wonder if we’ll be thinking the same (in another 50-100 years) about therapeutic practices used today. What I also really liked was the way Kelly wrote about and reflected on family, relationships as well as mental health (which might seem like a no-brainer given the setting, but is really quite separate) and dementia. 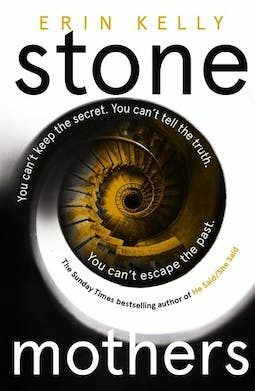 Stone Mothers by Erin Kelly was published in Australia by Hachette and is available this week.